Joyner grew up in Worcester Massachusetts hearing hip hop luminaries like Biggie, Nas, and Method Man pumping through neighborhood speakers into his small apartment where he grew up with 2 siblings. By the age of 7, while other kids were putting together puzzles and building legos, Joyner was piecing together words and designing simple rhyme schemes. At the age of 10 he convinced his father to let him record his debut song “annihilate ‘em” at a nearby studio and instantly knew the booth was his doorway to destiny. Recording under the alias “G-Storm” as an adolescent, Joyner quickly grew a reputation as a naturally gifted MC with a hunger for more. While rap was shifting towards commercial appeal and tales of extravagant splurging, Joyner was focused on interpreting timeless realities through his third eye view. In 2007, the emerging rapper changed his name to Future Joyner and joined forces with his uncle (producer Cyrus tha Great), Sheen Philips, and Dj Prince to form the “Film Skool Rejekts”. Their mixtape “Workprint: The Greatest Mixtape of All Time” featuring Joyner along with his talented team created waves in underground hip hop circles popping up on major blog sites such as hiphopdx.com & 2dopeboyz.com. While Dj Prince & Cyrus tha Great went on to work with Skyzoo becoming Sky’s Dj and featured producer respectively, Joyner was left with a pocketful of talent and a fistful of authenticity in a music industry where talent and authenticity were currencies of the past. 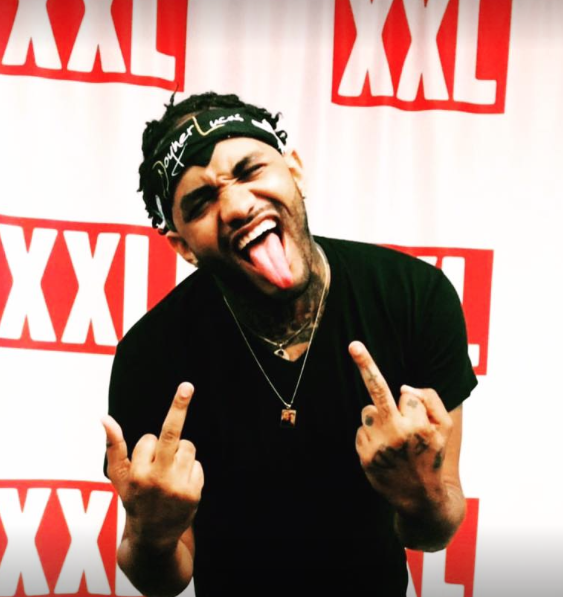 With the radio becoming a bureaucracy, and record labels ignoring skill; Joyner headed from Massachusetts to Montana to regroup, reload, and hit the world with his 2011 solo debut “Listen 2 Me”. With provocative punchlines, thumping beats, and limited promotion the project still managed to quickly gain fans, followers, and exposure somehow finding its way into iPhones of thirsty hip hop fans craving something dope and new. Since then, Joyner has won several rap competitions, dropped visuals in support of “Listen 2 Me” & LFOs, and created several standalone music videos to entertain fans across the world. In 2012, when the hip hop world welcomed Atlanta rapper “Future,” Joyner Lucas sticking with his vow to be different, dropped the alias “Future” from his name, added his government last name becoming “Joyner Lucas”. His goal is to connect with fans and impact their lives through well executed, innovative, entertaining music. Joyner Lucas does not want to be remembered for rapping… he wants to be remembered for creating that moment you fell in love with hip hop… again. Be on the lookout for the upcoming “Along Came Joyner” scheduled to drop early in 2015.